Doug is having the time of his life. But like TJackson20 commented on the last page…what about Marcos Stamatis? “Doctor Who” by Calista BrillTHIS IS A GUEST BLOG POST, BY CALISTA, WHICH WILL EVENTUALLY BE REVEALED TO BE ABOUT DOCTOR WHO, AND, PRESUMABLY, BY EXTENSION, ABOUT ASTRONAUT ACADEMY. OKAY? OKAY. There’s this principle about character design in comics, which has been really nicely explained by Scott McCloud in Understanding Comics, but which was probably around before that (I don’t actually know!). Anyway, this principle says that for maximum emotional connection between the reader and the comic book character, you want the character design to be pretty simple. Not so simple as a smiley face, but not so complex that it begins to approach realism. There’s a happy medium, McCloud says (and folks agree!) where a character design is distinct enough to convey individuality, but simple enough that there’s a lot of visual information, well, missing. This is the chart I’m talking about, from Understanding Comics. One of those guys in the middle is the happy medium, right? You know you’re dealing with a white adult male with a certain kind of haircut, but that’s all you get. And that means that all those little opportunities for specificity that are being left off? Your brain gets busy filling them in. You get to do some work, there, imagining what this guy really looks like, what he’s really about. And there’s this alchemy that happens when you start putting WORK into your experience of a story, that makes it about ten thousand times more exciting, more moving, just… better. So how is this about Doctor Who? Listen, have you ever watched any of the old Doctor Who? The pre-reboot stuff? I hadn’t. I hadn’t even seen the reboot. I know, I’m a terrible nerd. But I’ve redeemed myself since then. In the last six months or so, I’ve been having sort of a Doctor Who renaissance. I’ve watched a lot of the new stuff, and a lot of the old stuff. And you know what? I like the old stuff better. It’s hyper-low-budget, it’s campy, it doesn’t make any goddamn sense, it’s frequently racist, and it’s otherwise sort of badly written. But when I watch the new show, which is about one thousand times slicker, faster, wittier, and just objectively BETTER, there’s a part of my heart that stays closed. When I watch Tom Baker desperately battling a pile of saran wrap with blinking christmas lights in it, my heart opens up like a freaking FLOWER. 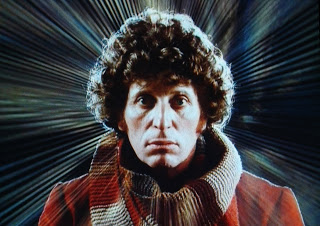 Part of it is, well, Tom Baker. But a big part of it is how profoundly that show trusts you to take a leap with it. To just go ahead and commit yourself to believing for a few moments that the glowing tangle of plastic wrap is scary, that it’s alive, that it’s talking. If you’re willing to put that part of yourself into the experience, if you’re not just sitting there and waiting for it to convince you… it’s the same alchemy that McCloud talks about with character design. It’s the amazing thing that happens when you get to contribute something of your own to the experience of a story. You go from being the passive receiver of it to being an active participant in it. This is something kids do naturally, by reflex. And it’s something that can get harder to manage as you grow up. The reality of the world becomes a much more fixed entity in your mind, and you begin to think of yourself as existing within that rigid matrix of the real – you might even think of that as a virtue. And certainly is sometimes. But it can be SO BORING if that’s the only way you interact with the world. The old Doctor Who cheerfully throws all of that out the window. It presents you with the shabbiest suggestion of an alien, and invites you to get on board with the game of pretend. And I am just *so delighted* to accept that invitation. So how is this about Astronaut Academy? 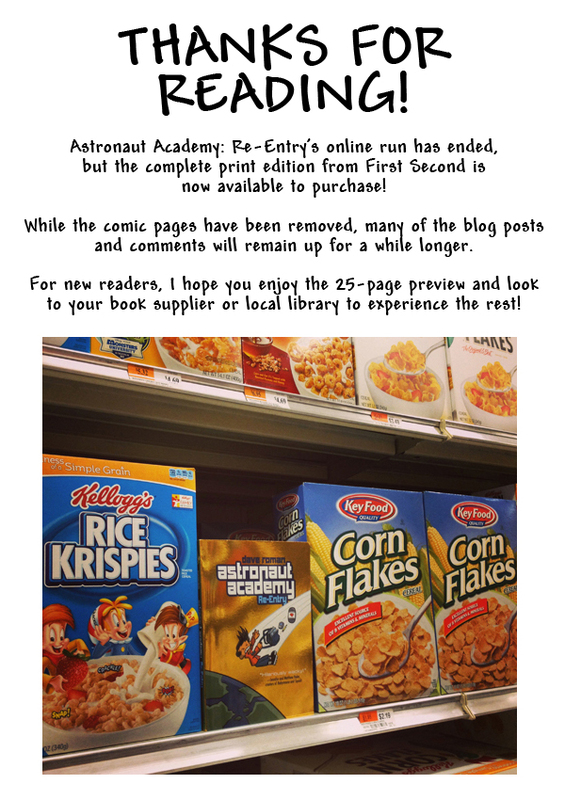 One of the things I love about Astronaut Academy (and I do love it – I even edited it!) is that although it’s funny, and full of pop culture references, it’s not a satire. There’s nothing cynical or unkind about it. This is a comic that channels that kid-brain impulse to just throw caution to the winds and GO for it. Panda Spanish Teacher? On board. 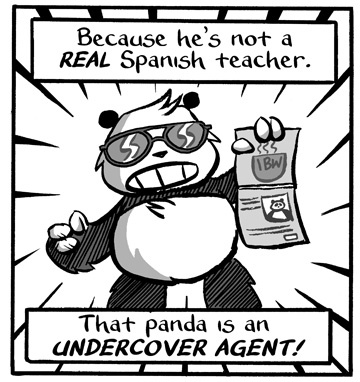 Panda Spanish Teacher is a secret time-traveling spy? Let’s rock this thing. Robot Clone? Sure. Robot Clone carrying one of your hearts? Sounds good! Robot Clone who finds meaning in life through monster-fight-card-collecting? Bring it on. Calista Brill is senior editor at First Second books. Check out her recent blog post A Day In The Life of a Senior Editor over at the :01 blog.